Unless we already have a visual image of our Spirit guide through journeying, meditation or clairvoyance, it may appear hard to confirm the accuracy of the likeness. However each guide has a distinct presence and energy that the viewer will respond to, and for many of us this is the most powerful form of confirmation or 'proof'. It is this presence that will feel the same, whatever visual persona the guide appears in. Who are our Spirit guides? In my experience they are our closest soul mates within our soul group who have been with us over many lifetimes and, having now evolved from the earth plane themselves, devote themselves to supporting, guiding, inspiring and empowering us during our remaining time here. Guides can present themselves in one of an almost unlimited number of personas, such is the number of lifetimes they have had, and this is why clairvoyants can sometimes pick up on different things to what you may see or sense yourself. When being drawn, a guide will generally present him or herself in a persona that most closely resonates and empowers you at this time - and always from a lifetime of deep love and connection with you. You can also read some testimonials here. A wonderfully calming energy in this guide's persona as a French monk (above). He has shared many other lifetimes with the portrait's recipient including oriental and Native American. The Spirit guide of a young girl, presenting in the persona from a lifetime where they were very close sisters. This was very comforting for the recipient who is an only child. Sarah immediately connected with her African healing guide she knows as 'Empira'. Sarah's guide (above) was her husband in the lifetime they shared together. Her other guide, 'Empira' (left) was her father in the same lifetime. Such a loving sisterly energy to this guide - she and the portrait's recipient (an elderly grandmother called Cathie) were very close friends in one of many lifetimes they shared together. She presented herself in this persona because it would be the most empowering and easily recognisable for Cathie, who is going blind - but was able to see the portrait! This chap wasn't what his recipient was expecting at all! But she had a strong Navajo connection through one of many lifetimes with this wonderfully supportive Spirit guide. A beautiful energy - a Tibetan monk full of love, calmness and strength for the portrait's recipient. The recipient of this beautiful guide energy - a Cherokee woman - immediately felt a strong and very emotional soul connection with her. Spirit guides are some of our closest soul mates, and sometimes they can even be our ancestors, as in the case of this beautiful guide, Meera. To compare the uncanny likeness she has with her descendant, daughter of the portrait's recipient, visit the Testimonial's page. This is Birstan, 9-10th Century Saint and Bishop of Winchester, and guide and close soul mate of the portrait's recipient. As she was young girl, Birstan was at great pains to ensure it was as loving, joyful and approachable as possible. This would have been hard not to achieve - he was a fabulously loving energy to draw. On seeing the portrait, she was nearly reduced to tears at the connection she felt with him. This Abbess had shared both 'nun' and 'monk' lifetimes with the portrait's recipient, but appears in her persona as an Abbess because with of the qualities of mothering, love, nurturing and humour she felt during this special lifetime they shared together. Another nun! As with the Abbess above, Spirit guides tend to appear in the persona most relevant or supportive to the recipient. Often it's the persona we shared a past lifetime with, as with this very loving energy, Sister Mary. What's so interesting is how relevant the colours are when doing portraits - blue here representing communication and healing. This beautiful angelic energy connects with the portrait's recipient, a sound healer. This portrait was a novelty for me. A magical, faerie energy, fragile and ephemeral, I saw her in my mind's eye as clearly as if I'd looked at a photograph. She finds humans heavy going and I think she thought I was terribly slow drawing her, so she disappeared for a while, returning only to give a message at the end. In return for making her known to her human recipient, she left me filled with a wonderful feeling of fun, laughter and joy for the rest of the day - I couldn't stop smiling. This ab-fab African guide Henrietta came through beaming with smiles, love and a colour explosion for recipient Kate. Henrietta was so full of charisma, charm and humour that afterwards our Westie spent a good 15 minutes barking at her! Notice how the colours (especially background) reflect an aspect of the energy guide brings with them - in this case, a whole heap of creativity, fun, confidence and healing. This was just what Kate needed while going through the later stages of cancer. Connecting with Henrietta was incredibly empowering and healing for her. Read more about Kate and how she's kept in touch with us all since her passing into Spirit herself. This strong and empowering guide and the portrait's recipient were close sisters and warriors, sharing battles, children and great loss together which brought them even closer. A Spirit guide from a shared lifetime in Atlantis with the portrait's recipient, a crystal expert and healer. Note the glasses - they were made of polished crystal and supported without temples (the bits that go over the ears). Another healing guide for Sarah, whose other guide portraits are further below. She surrounds herself in her portrait when she works and finds them empowering in her connection with Spirit. Fabulous warmth and love from this guide. In this persona he was in the same Native American tribe as my own guide Dancing Bear, so while drawing him I was surrounded in the laughter and love between old friends getting together to reminisce over their old warrior days! Another beautiful energy to draw, and an empowering and healing one for the recipient, who was healing with a life-changing health condition. A Navajo headman. Navajo's didn't have tribal chiefs as villagers were so scattered. Instead they had various headman who would loosely govern the people in their own area. A Maori warrior guide with his blue face tattoo or 'ta moko'. A powerful, loving energy that connects with his recipient through many lifetimes, as brother, father and husband and many other personas. This Spirit guide was one of a healing group of guides who work with Sarah. The guide I focused on was the one who presented himself to be drawn, but his energy is the group energy, which was their intention. Ruth's guide wanted to bring her love and support and so presented herself in her most loving, motherly persona, which was a nun. Val, who has always been drawn to the Middle East, wasn't surprised to find that she'd shared many lifetimes with her Spirit guide, who in this persona came from the Holy Lands. Our guides are from our own close soul group. Over many lifetimes, they have have accumulated knowledge and experience which they use to help and guide us on our own paths - in this case, a vet. The feelings we have towards our own guides when we see their portrait is often profoundly moving. Julia instantly recognised this respectful and very loving oriental guide's energy and personality. A very loving energy presenting herself as a Red Cross nurse. A native American guide - also with a very loving energy. Spirit guides can appear as native Americans because in those lifetimes they experienced the deepest spiritual awareness and wisdom. As with all our guides, this Spirit guide had shared many lifetimes with the portrait's recipient. 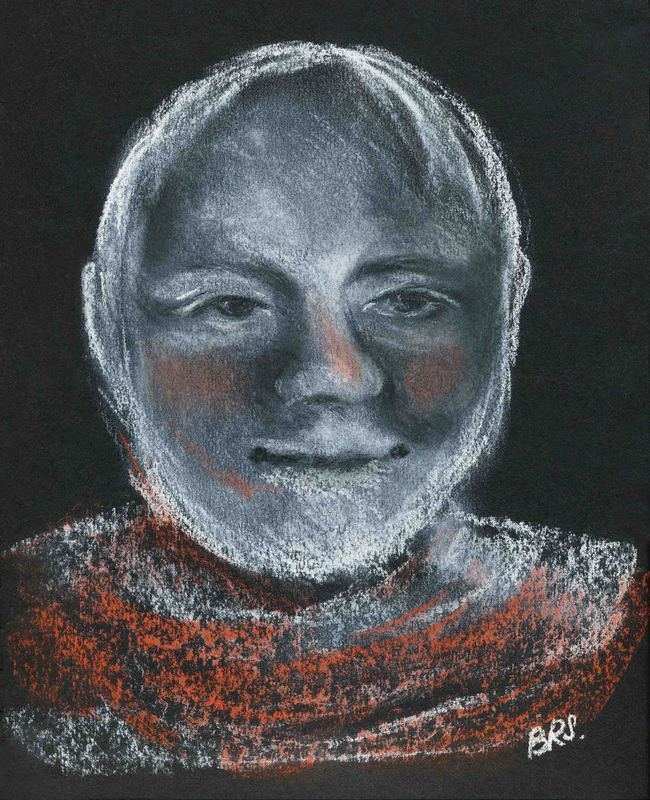 The recipient of this spirit guide portrait felt an instant connection with this nurse who shared a past life with her. Guides tend to appear in the persona that is the most relevant, comforting or recognisable to the recipient. I drew this portrait of Pauline's female spirit guide, but interestingly she says it's a very good likeness of her first husband! They are close soul mates and she believes he chose to remain close to her. He must have been standing so close to me, to check up on how the picture was getting along, that I picked up on his energy too! Normally other energies stand back a little so I can focus on one guide, but it must have been allowed as it brought Pauline great comfort. Before starting a portrait, I'll meditate or journey to connect with my own Spirit guides, the recipient and their guides. Sometimes I get an image of a guide in my mind's eye, but other times I have to piece it together with each visual fragment of the face as I receive it, as with the priest/monk here. A lot of Spirit art can be about "feeling" your way around the portrait and altering anything that doesn't feel right. This information can come through a hunch, clairvoyantly or clairaudiently. For me it's usually a combination of all three. Mary's African guide has such a warm, loving presence and was a joy to connect with and draw. Another empowering guide for Mary - bringing healing and balance with all that green light! This Spirit Guide portrait astounded Enid, who confirmed that he was exactly like she'd seen him clairvoyantly. Enid also had a very loving, supportive female energy standing behind her when she gave tarot readings. Enid identified this as being a younger part of herself that she felt had stepped back so she could receive clearer guidance while giving readings. Or it may be her Higher Self. Have you ever doodled a face, thinking you're just "making it up"? 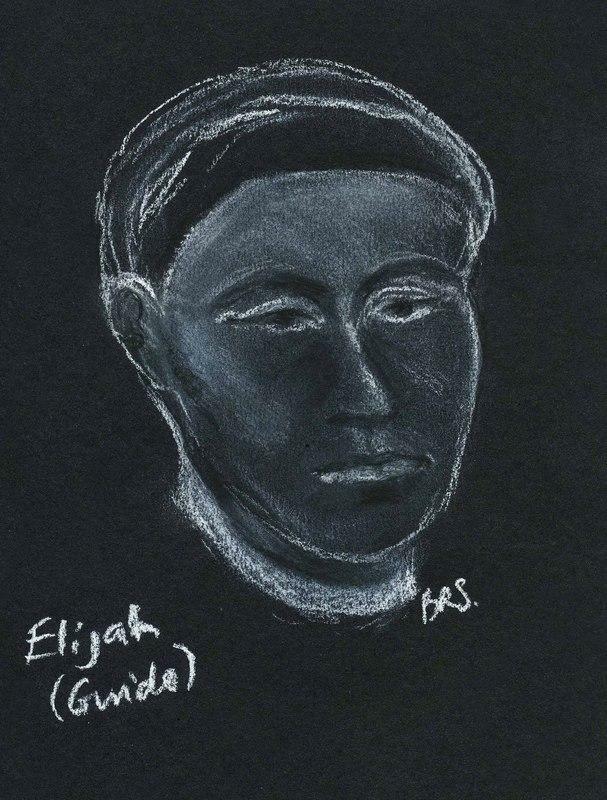 I was thinking that when I drew this, only to have a mediumistic friend of mine confirm that it was Elijah, a spirit guide who had connected with her recently. This angelic energy showed herself visually and clearly at the beginning and would "reappear" in my mind's eye if I needed reminding during the portrait session. This female African warrior guide came through very quickly and didn't stay long. I love how the energy and personality of a guide is really coming through in each portrait. Spirit guides can appear in different personas, depending on your needs, as in the case of my own guide, Dancing Bear, who first appeared to me as a monk. This sensitive tailoring of personas to what we need most at the time is typical of guides and why we often think our Spirit guides change over the course of a lifetime. Brother John took me on many exploratory, teaching and healing journeys in my 20s and 30s - little did I realise what I was getting myself into! This picture (above) is of Dancing Bear - we have been on thousands of journeys since my days with him as Brother John.